1. Stress relief. My personal reason for starting the practice, I desperately needed the tools to cope. A few minutes of yoga during the day can be a great way to get rid of stress that accumulates daily - in both the body and mind. Yoga postures, pranayama and meditation are effective techniques to release stress. 2. All-round fitness. You are truly healthy when you are not just physically fit but also mentally and emotionally balanced. 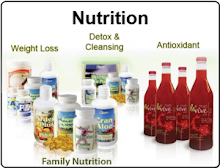 Related Post: De-tox Winter 2014 For A New You! For more insight watch this episode of Yoga Flava TV and then proceed with the rest of the benefits list below. According to Wikapedia - Affirmations in New Thought and New Age terminology refers primarily to the practice of positive thinking and self-empowerment—fostering a belief that "a positive mental attitude supported by affirmations will achieve success in anything." More specifically, an affirmation is a carefully formatted statement that should be repeated to one's self and written down frequently. For an affirmation to be effective, it needs to be present tense, positive, personal and specific. When I began my Yoga practice in 1995, I immediately noticed the great relief I felt from the movement of my physical practice. My meditation practice also helped to ease the chatter that had been programed into me by my environment. Affirmations help me to reprogram, each day I seek to find the words to feed my mind and spirit to consciously move my life in the direction that I desire. Related Post: Affirmation For Today: "I visualize and create marvels in my life." Each morning the first thing I do to set the tone for my day is read and view videos for inspiration. Recently I started creating affirmations starting with "I AM." Starting an affirmation with "I AM" brings the thought energy directly to me about me. I have been posting my affirmations daily on my Facebook page and they have been receiving the most likes. 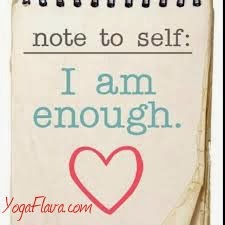 I will be writing more on this subject.... until then.... Today's Affirmation - Note To Self: "I Am Enough." How is it going for you this winter? If you are on the east coast you most likely are a winter warrior, figuring out your Winter Wellness Plan. It has been no joke - truly a challenging winter wonderland outside! For most of us it really has an affect on our mind, body and spirit and can result in "Seasonal Affective Disorder" (SAD). I confess that under the covers has become more appealing than getting on my Yoga Mat. With Spring starting next Month (Thursday, March 20, 2014) let's get ready to spring it on! Yoga is not a cure for SAD, which is a medical and chemical condition, but it can alleviate many of the physical and mental symptoms, making seasonal depression more manageable. Proper breathing (pranayama) followed by restorative postures may help people with SAD. 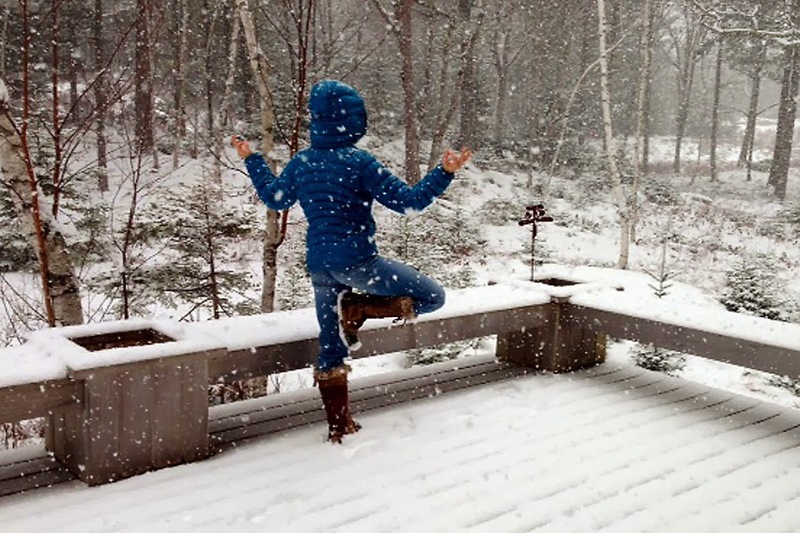 Yoga helps you to be positive and motivated during winter. It increases your energy levels, releases endorphins and serotonin, and can decrease melatonin (which causes tiredness and mental sluggishness). Yoga eases sleeping problems, stress, anxiety and depression, as it incorporates the main drug-free treatments for these – exercise, deep breathing and relaxation techniques.